A blog about justice, tax policy and sometimes more. One of Adam Smith’s principles of taxation is that it should be as convenient as possible for the tax collector and the taxpayer. Withholding tax at source (as with PAYE systems) is a good way to do this. What the taxpayer receives is theirs to keep and (ideally) they will not have to pay any further tax on it. It is common to withhold tax on wages, but I think that technological advances open up the possibility of a new paradigm here; tax withholding on all financial transactions. If the tax and financial transfer systems were integrated then it would be possible to withhold tax as soon and accurately as possible. There would be no need to withhold taxes on wages as tax would be withheld at the second stage of the transaction - when received rather than when sent. How would this work? A financial company receiving a payment intended for one of their account holders would send an electronic message to the tax authority informing them of the amount involved and the account number for the source of the funds. The tax authority would need to have a record of the owner of all other financial accounts to do things this way around, but this should be easy to maintain and update. If the person receiving a payment is transferring money from another of their personal accounts then no tax would be payable. However, if the income comes from another individual or entity (such as their employer) then it would be taxable. This fits in with my tax base proposal whereby all income would be taxed, irrespective of source (though spouses with joint tax accounts could transfer money between them tax-free, and there would be a process by which people could receive refunds and loans). However, if different sources were to be taxed differently then this can be accounted for by adding a table to the database indicating the sources and linking to different tax rules. The tax authority would calculate how much of the income should be taxed and which should be forwarded to the person involved. This would be integrated with real time tax calculations so the amount withheld would ensure that the person has paid the correct amount of tax and received the correct amount of income up to that point. This process could be undertaken on a single transaction or the financial institution could process batches of many calculations at once. Are there any downsides in using Financial Institutions to withhold tax? The first potential problem I can foresee is that financial corporations might delay the submission of the money to the tax authority. However, it this was a problem it would simply have to be legislated that this should be transferred within a particular (very short) timeframe. After all – the money should be transferred immediately to the account of the recipient so there would be no justification for delays to either payment. The second potential problem is the reliability of the system. If there was a problem with the tax authority computer system, or with the connection between this system and the financial institution then it would appear that no transactions could take place. However, this need not be the case. A backup system should be possible by simply using the last tax rate applied for the taxpayer in question and informing the tax authority of the amounts involved. The financial institution could make reference to either the percentage of tax withheld on their last transaction with the institutions, or the publicly available lifetime tax percentage paid by the individual up until that point. The third concern is that taxing all transactions automatically might encourage people to do make payment in cash or non-financial forms of property (like precious metals or other goods). Issues of fraud are serious ones that I discuss in my book and will discuss in future blogs (including the next one). However, one point I would make is that the idea of a cashless society is a real possibility in the future – do they have cash in Star Trek? Contactless debit cards and online transactions are recent examples of this gradual shift. I’ve indicated how these downsides can be overcome, and I will develop some of these themes further in future blogs. The question for readers is, as so often the case, to point anything important I have overlooked. Political philosophy and public policy tutor/writer/researcher. 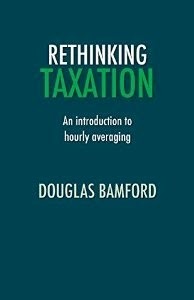 Creator/advocate of Hourly Averaging and the CLIPH-rate tax, which are presented in my book Rethinking Taxation (Searching Finance, 2014). My academic background is in political philosophy and I am keen to apply principles of justice to the tax and benefit systems. I am also interested in how new technology can change the economic system. My PhD at Warwick University was entitled "Egalitarian taxation: Equality of resources, market luck, and leisure." What is the CLIPH-rate tax? What are the advantages of the CLIPH-rate tax?